In a typical workweek, I leave a few blocks each week for recipe testing. While it’s work, it’s one of my favorite jobs. Unfortunately, my work/life schedule has been out of whack for a few weeks. Due to work and family commitments I’ve been on the road more than I’ve been home. Just this week I had one 16-hour stretch at home out of seven days, so there was no time for recipe testing. At times like that I feel fortunate that I have a vault of recipes that I can share, but I also miss my kitchen time and feel like I’m not meeting my goals. As long as nothing goes sideways, I’ll be home for the entire next week (That hasn’t happened in months), and I’ll be working on an assortment of recipes. For this week, I hope you enjoy these two fall-themed recipes from the Think Tasty archives. To learn more about this apple recipe (which would also work well for dessert), first published in October 2009, keep reading. I don’t know if it is just my household, but we get into culinary trends. My husband tried braising meats late in the spring, and ever since then it has been his go-to dish. Not that I’m complaining. Braising produces such a wonderfully tender meat and makes the house smell incredible. Since his first foray into braising, we have had many wonderful dinners of beef, lamb, and pork. My recent culinary trend has been caramelizing. I have made caramelized onions, bananas, and squash, among other ingredients. For a weekend breakfast for two, I decided to make caramelized apples to top French toast made with homemade honey oatmeal bread. Served with a side of crispy prosciutto, there was a nice mix of sweet and salty. While my original intent for these apples was as a topping for our French toast, they actually worked quite nicely as a side dish. Served atop the French toast, they added a nice layer of flavor, but separately each item’s individual flavors were even more enjoyable. 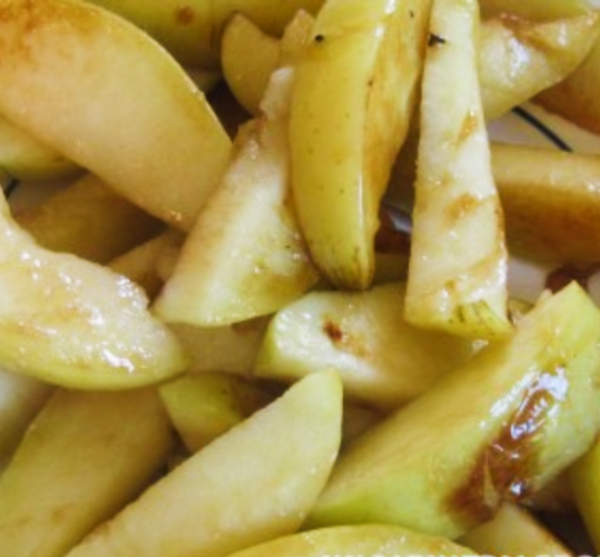 If apples are in season where you live, as they are here, I would recommend trying this recipe soon. I made this recipe with newly picked gingergolds and was pleased with the results. While non-native apples would work, I think they would lose some of their flavor and crispness. Preheat large nonstick pan over medium-low heat. 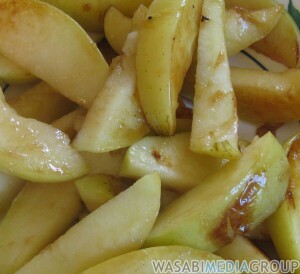 Melt butter in pan, and add apple slices. Toss to coat with butter, and allow to cook for 5 minutes, or until crisp-tender. Sprinkle with brown sugar, and cook for an additional minute or two. *Other apple varieties can be used. Choosing an apple that is firm with a slight bit of tartness is recommended.